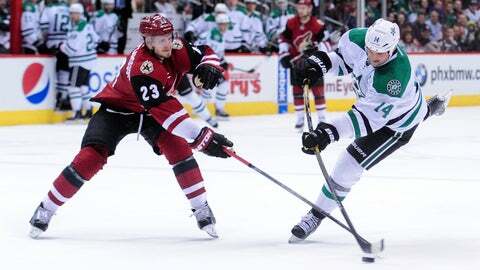 Stars captain Jamie Benn, defended by Oliver Ekman-Larsson, has 54 points for Dallas. The Arizona Coyotes will be looking for a more focused effort when they take on the Dallas Stars in the second game of a road back-to-back. The Coyotes (21-31-7) are coming off a 6-3 loss at Chicago on Thursday night and are now 8-17-4 on the road. Coach Dave Tippett was particularly critical of the play of his veterans in the Chicago loss. The Coyotes rallied back from a 3-1 deficit to tie it 3-3 by the end of the first period, but it was all Blackhawks over the final 40 minutes. Dallas (23-27-10) will be playing its first game since a 4-3 overtime win against the Tampa Bay Lightning on Saturday. The Stars were just 3-7-0 in the 10 games prior to their league-mandated bye and sit eight points behind eight-place Calgary in the Western Conference standings. Dallas coach Lindy Ruff said he’s concerned about coming back sharp from the layoff. One plus to come from the break is that injured Dallas defenseman Johnny Oduya (lower body), out the past 14 games, is closer to returning, though Ruff said he wouldn’t play Friday. Oduya, who was part of two Stanley Cup championship teams in Chicago, is one of three Stars veterans who could be traded prior to the March 1 NHL Trade Deadline. Forward Patrick Eaves, who has set a new career-high with 21 goals, could also be on the move, especially since Eaves is an unrestricted free agent at season’s end. Forward Patrick Sharp, who also played with Oduya in Chicago, is also a candidate to be traded, although Sharp has a partial no-trade clause in his contract, blocking a deal to 10 teams. But who could be traded or who stays put is of secondary importance to Benn. The Stars beat the Coyotes 3-2 in Glendale on Dec. 28 in the only previous meeting this season — getting a goal and an assist from Jason Spezza. Dallas continues to have two of the top offensive players in the league in Tyler Seguin (59 points) and Benn (54), but the Stars are 29th in the league in goals-against average at 3.20, just behind Arizona at 3.19. Louis Domingue is scheduled to start in goal tonight for Arizona.